A New York attitude! Somehow we all have our own image of what that New York attitude is. In my opinion this dog sure has one. It passed us on the street one day and gave us this look. We printed the text on a tote bag and take it with us wherever we go. It's lightweight and comes in handy when we go shopping. Mention attitude in where it says "kortingscode" and get a € 2 discount throughout May 2018. The discount shows during the checkoutprocess. 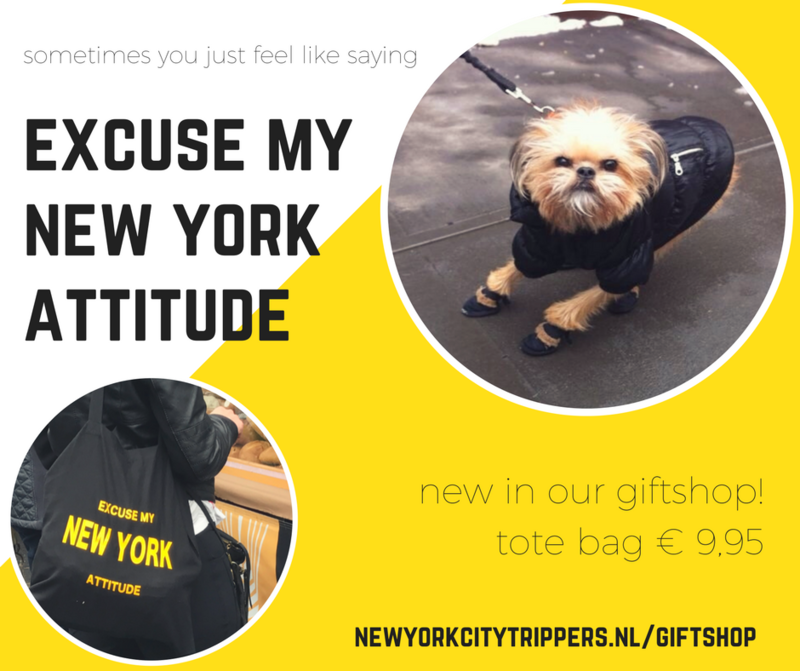 Find this tote - along with other gifts for New York City lovers - in our giftshop. Rather have it printed on a t-shirt? No problem! Just send an e-mail to info@newyorkcitytrippers.com and we'll fix it for you! Especially for Valentine’s Day.My favorite and best pieces of LOVE streetart in NYC. Get into a New York state of mind instantly with this lovely book by Megan Hess. For all you doglovers out there, let me guide you through a dogs life in New York City. KLM has a great sale going on to lots of places in the USA! Limited time only. Hurry! Knowing us will get you free drinks in The Summit Bar in the East Village! Good deal right? A typical New York dessert but also very popular during the day. A New York attitude. We printed it on a tote bag and take that everywhere we go! A true hit in Manhattan; The Drybar. As they say: no cuts, no color, just blowouts. Is going to New York City one of your New Year’s resolutions? We’ll help you plan! Taste Christmas in New York with this cookbook filled with NYC recipes and pictures. The layout of Manhattan is like a grid with Streets and Avenues. Easy to get around. Want to look like a local? Act like one! Here is how: 1. Never ever stare at someone.